That unedited audio shows you what CNN edited out of the interview. Can you see that certain people get better coverage by the media? Photo: Christopher Bollyn discusses the evidence of 9/11 with Deborah Feyerick prior to the CNN interview at Schaumburg library. 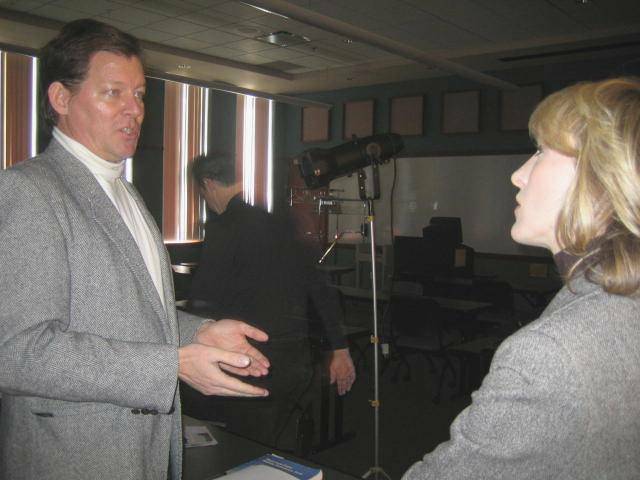 CNN sent a team from New York City to Chicago to interview Christopher Bollyn, 9/11 researcher and independent journalist, at the Schaumburg Township District Library on January 23, 2007. Bollyn was interviewed for more than two hours by reporter Deborah Feyerick for a piece being produced by Sheila Steffen. The segment is expected to air at the end of the current week. Bollyn was told that the section of the program with his comments should be about 3 and a half minutes in length. The CNN interviewers were very interested in knowing why Bollyn did not believe the official version. They were also keenly interested in why he thinks agents of the state of Israel were involved in the terror attacks on the World Trade Center. Bollyn explained that the fact that Israel-based employees of Odigo had received instant text messages warning of the WTC attacks hours before they occurred and that these warnings had been accurate "to the minute" indicated that some Israelis (including employees of the Mossad-linked company) had clearly been forewarned. "To have prior knowledge of a crime like 9/11 indicates involvement," Bollyn said. Odigo had its U.S. headquarters a few blocks from the twin towers of the WTC. Had the Odigo warnings of an imminent attack been passed on to the authorities in New York City, thousands of lives could have been saved. The CNN team was also very interested in the 5 "dancing Israelis" who were arrested in New Jersey after having been observed videotaping and celebrating the attacks on the twin towers. Bollyn explained that he had investigated the story of the dancing Israelis through Paolo Lima, the New Jersey-based reporter who had followed the story in the days after 9/11. When it was reported by Lima in 2001 that the 5 men, who pretended to be movers, were Israeli citizens who had been caught with a van that tested positive for explosives, multiple passports, thousands of dollars in cash, and box cutters, Bollyn raised the question that they could be working for Israeli intelligence. The men also reportedly had been wearing Middle Eastern clothing to give the appearance that they were Arabs. Months later, Urban Moving Systems, the fake moving company that the men "worked" for was exposed to be a Mossad front company based on information provided to the Forward newspaper of New York City. Dominic Suter, the head of the Weehawken, NJ-based Mossad front company, fled the United States immediately after 9/11 before the FBI could interview him. After being released from U.S. custody, the 5 Israeli agents returned to Israel where they appeared on a popular television show and openly explained that their "purpose" had been sent to "document the event." This admission certainly indicates prior knowledge of the attacks, which is proof of involvement. See: "The Likud Criminal Gang Behind 9/11 and the War on Terror"
The CNN interviewer repeatedly asked Bollyn, "Who did it?" Bollyn responded, "I wish I knew," and described the 9/11 terror attack as "an unsolved crime." He explained that he does not speculate and works from evidence and information he comes across. Most recently, for example, he has been investigating the evidence that Thermate was used in the World Trade Center attack and demolitions. The CNN program will also include interviews with critics of Bollyn from the Anti-Defamation League (ADL) and the Southern Poverty Law Center. The ADL, for example, has often labeled Bollyn as an anti-Semite, which is not true. Knowing that the mainstream media is generally hostile to 9/11 skeptics and independent researchers, Bollyn, a scholar of Middle Eastern history, explained that there is a fundamental difference between Zionism and Judaism. "There are Jews who are not Zionists and there are Zionists who are not Jews," he said. If elements of Israeli intelligence were involved in the attacks of 9/11, he said, that would be very unfortunate but it should have no bearing on innocent Jews anywhere in the world. The state of Israel claims to represent the Jews of the world, whether they support Zionism or not. Bollyn, who has lived in Israel and the Middle East, explained that while elements of the Israeli state appear to have been involved in the events of 9/11, they are from the most extreme right-wing group of revisionist Zionism. Many of the current officials in the government of the state of Israel are the sons and daughters of the terrorist Irgun organization of Vladimir Jabotinsky, the people who first brought terrorism to the Middle East and the world stage in the 1940s. Asked why 9/11 would have been done by Zionists, Bollyn said that as the "New Pearl Harbor," 9/11 had been carried out to sway public opinion and usher in the on-going War on Terror. This so-called War on Terror, he said, was first promoted publicly by the former Israeli Prime Minister Benjamin Netanyahu in his book, Terrorism: How the West Can Win, in 1986. The current U.S. military operations in Iraq and Afghanistan are exactly what Netanyahu called for in his book. The Bush administration has followed the agenda of Netanyahu's war on terror in the Middle East to the letter since coming to office in 2001. This policy, Bollyn said, is disastrous for the U.S., the region, world peace, and ultimately, even for the Jews. Ehud Olmert, the current Israeli prime minister, is a financial crook and a war criminal, Bollyn said. He was the co-defendant, with Menachem Atzmon, in a criminal financial scheme to raise funds in the United States and elsewhere for the Likud party when he was treasurer of the party in the late 1980s. While both men were involved in the scheme, Atzmon was convicted while Olmert was acquitted. Olmert went on to become the mayor of Jerusalem while Atzmon became a "security expert" at U.S. and European airports as the CEO of his "security" company, International Consultants of Targeted Security (ICTS). On 9/11, Olmert's old political ally and co-defendant Atzmon was the owner of Huntleigh USA, the company that provided passenger screening and security services at Boston's Logan airport and the airport of Newark, New Jersey. See: "The Israeli Prime Minister's Connection to 9/11"
While Bollyn's comments to CNN will certainly be drastically edited, he sincerely hopes and expects that CNN will not distort his opinions or allow him to be smeared as an anti-Semite.